This true low air loss hospital mattress is made in the USA and designed to heal up to stage four pressure sores. It operates using a blower based air pump that quickly inflates and effective manages moisture. This advanced low air system is commonly used in hospitals, but is excellent for home use. The 500 lb weight capacity can easily support the majority of patients. The cover is low shear, easy to clean and full encases the air cells. The pump is user friendly and easy to use. Auto firm and seat inflation feature makes it easy to transfer in and out of the bed. Ultra comfortable! 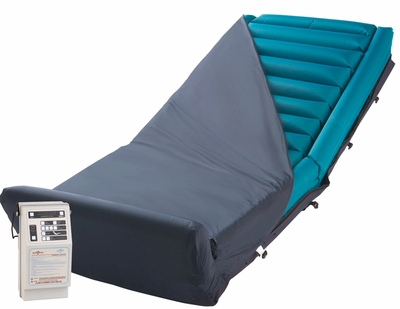 The elite in medical air mattress systems! Ideal for long term care, bed sore treatment , chronic pain or burns.